My trip to the desert of Dubai was nixed by means of a malfunctioning jumbo jet. 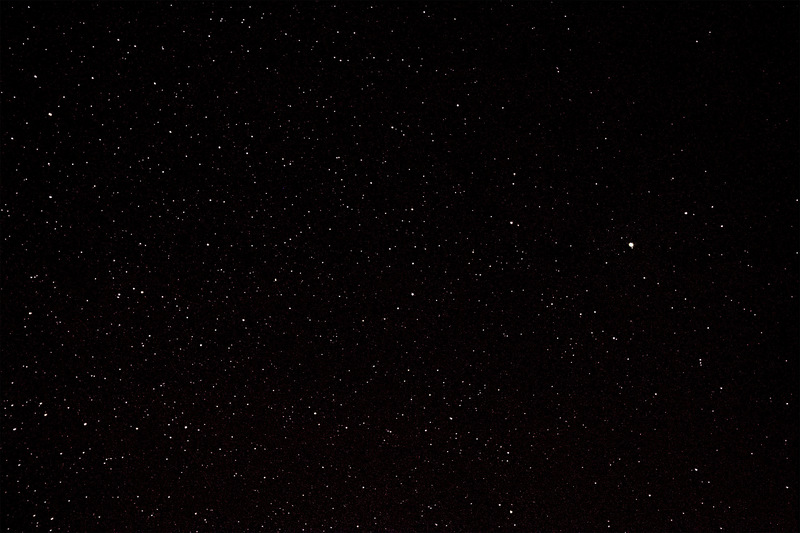 There were stars out there in the dry clear sky and no one to see them (well, not me at least). Though that ship has already sailed, I am trying to recover the opportunity here in Ireland and will do so if the clouds stay away. I hope you enjoy this journey-journal. It’s a long post and somewhat stream-of-conscious, but I wanted to do the best I could to share this memorable excursion with you all. My friend from Ireland whom I met in Paris told me I should visit Sherkin Island. Sounds great – I’ll earmark that email for later. Flying into Dublin from Orlando. 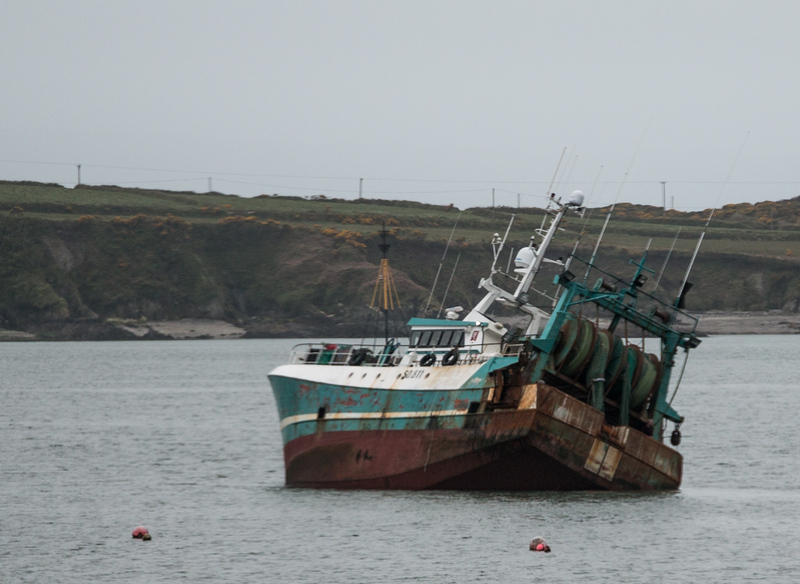 I think I’ll try to get out to Sherkin while I’m in Cork. Oh shoot, Cork isn’t nearly as far west as I thought. Probably won’t see those cliffs after all. Donncha and Dennis are the same name in different languages. My coworker Donncha invited me to stay with him instead of the hostel. That’s great, because the hostel didn’t exactly match its description. What an awesome family. Their son is obsessed with Minecraft; so cool because he’s learning that to do the “secret” things you have to learn how to program. I found a great café called the Webworkhouse but I won’t be working there because Donncha lives in Blarney. 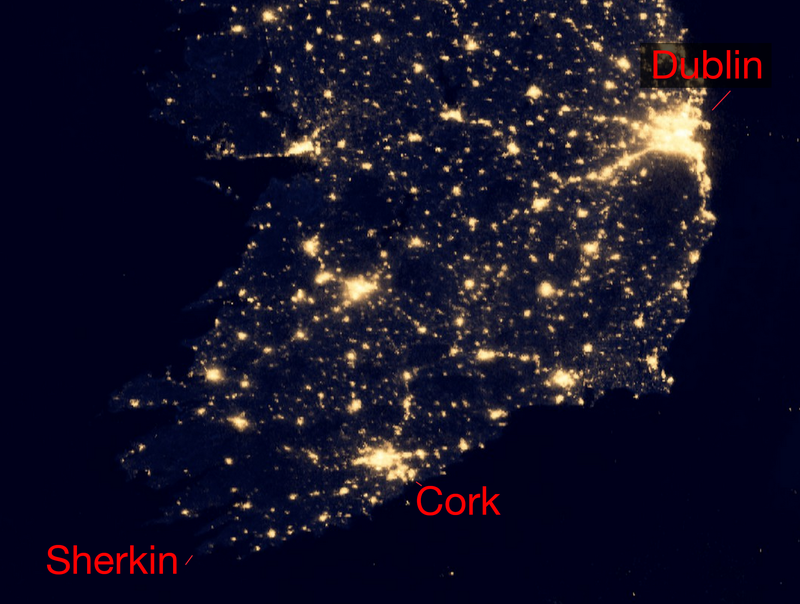 Plans for Cork are totally different now. Its chug chug chug announced the approach long before we could see it. Welcome, Thomas the tank engine. We might have exceeded the recommended speed in order to get to this vantage point before the train. We joined a group of photographers to catch this steam locomotive which runs once a year across Ireland. 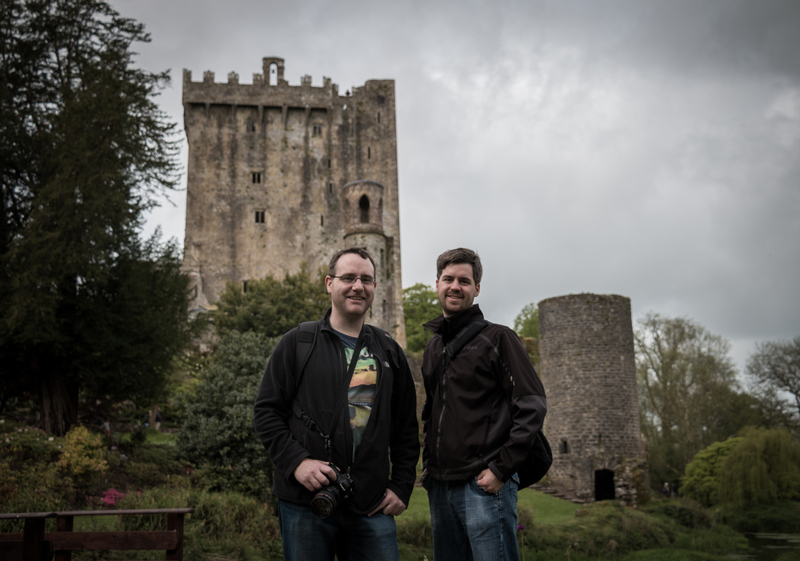 Donncha takes me on an insider tour around the Blarney Castle gardens. He comes here every morning for a walk and to charge up his portals for the game Ingress. He’s lucky in this regard because most of the activity in that game comes from tourists who spend a day there and then leave. Home court advantage for the win. The sign says you will have good luck if you walk backwards up the stairway behind this waterfall. It’s a deal between the Blarney grounds and a local witch. He’s been here a million times, but Donncha still finds great shots in this familiar territory. Where will those guys show up next? I’m taking more photos than usual because that’s what happens when I’m with people who like to take pictures. Donncha is a much better photographer than I am and I enjoy learning from him. 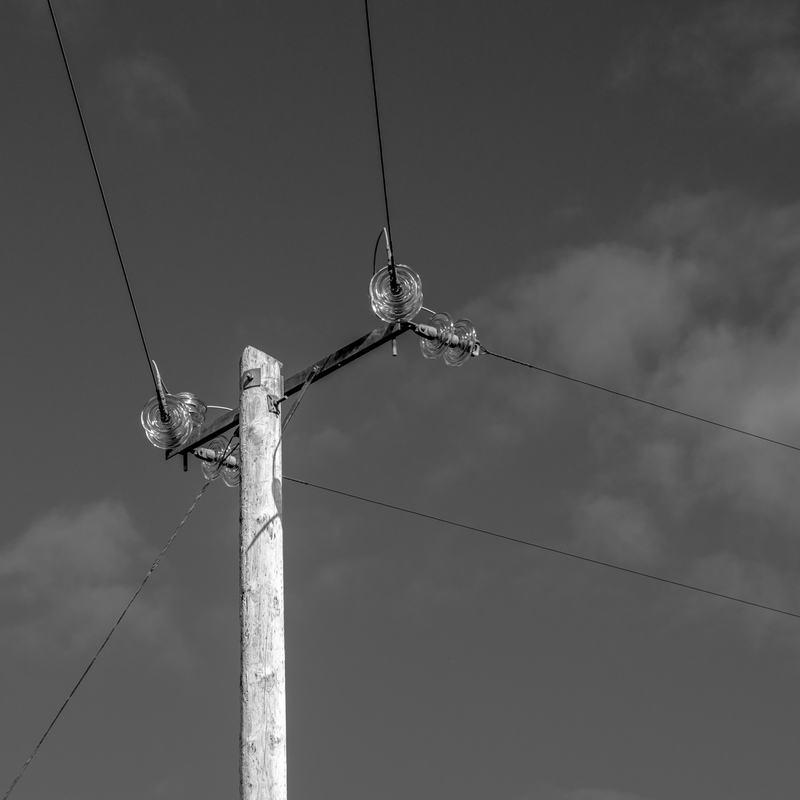 He takes me to a photographers’ club in Cobh (“Cove”) – another part of Ireland I wouldn’t have seen. His family has been wonderful to me. The photographers at the club were great and had remarkable works, though they were somewhat single-minded about their certifications and winning the competitions. 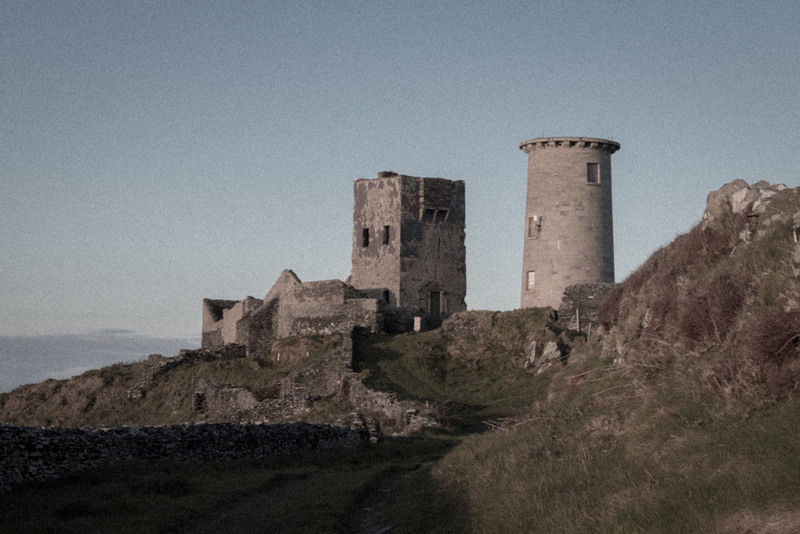 We stopped by an old tower castle on the way home – couldn’t have been more serene. I wonder if I cod get out to Sherkin Island. There’s a bus! Oh, it takes two hours plus a ferry and I wouldn’t get there until late. Not enough time to come back home. Darn. Things are so green here in Ireland, I wonder if I could find a place to escape outside of Dublin and take some shots of the stars. Wow, Dublin is a big and bright city – not the wonderland that is western Ireland. But wait! I’m not in any rush to get to Dublin, and the islands are some of the darkest places you can get to – I could spend the night out there! There’s the bus, there’s the ferry, emailed the dorm, and checked the forecast. If the sky is clear and it doesn’t rain (big if) then all things could work out! Lodging on Cape Clear Island fit my schedule better, so I’ll miss Sherkin but visit the neighbor. Cape Clear might be a little darker too. 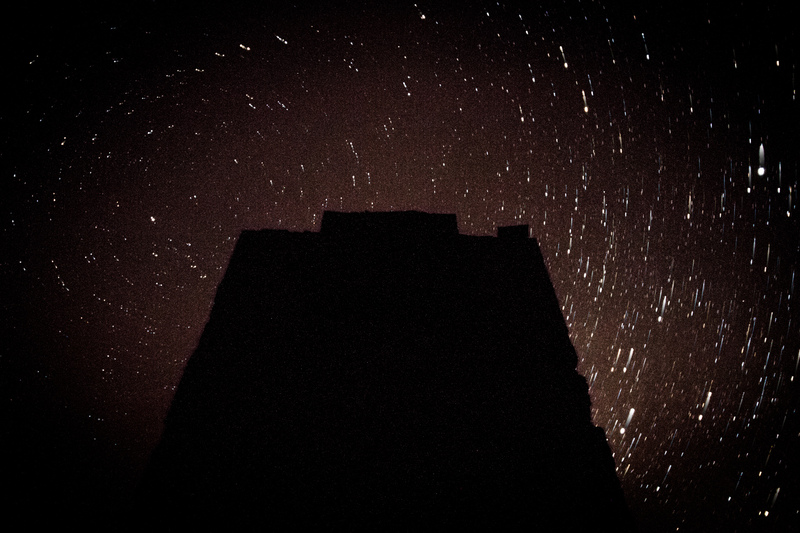 Notify my coworkers – “I’m taking tomorrow off to star-gaze.” Boy do I love this job. Download the star app, plan some shots. Got an email back from the hostel: we’re good to go there – 20€ for the night. This is going to happen! So much for my ride to Dublin; I’ll catch that tomorrow. 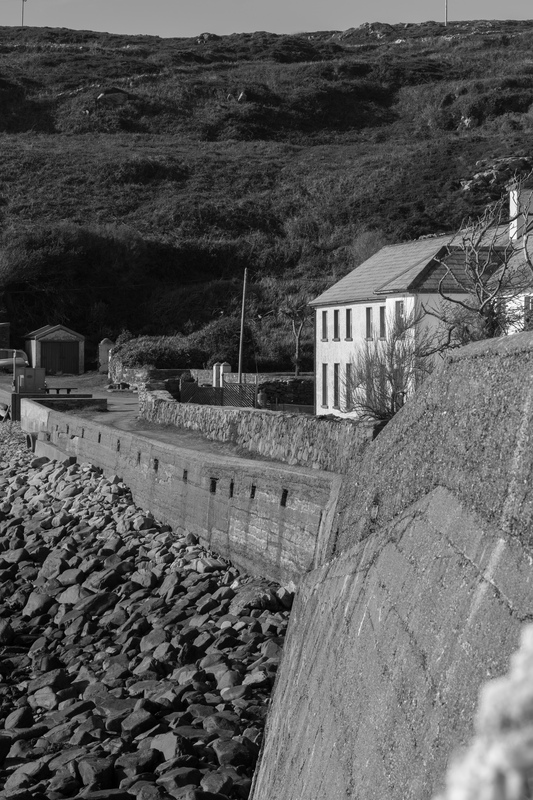 Pack up, find some possible vantage points on Cape Clear by scouting out on Google Earth. Charge all the things – I can’t let a dead battery block me. Time to go. Donncha is taking me to the bus stop and letting me keep my suitcase at his house. He’s going to bring it to me tomorrow when I arrive back in Cork. Bus leaves in an hour so – I get my ticket when I arrive at 11:00 am and wait. Met a friendly girl waiting for the bus – Meadhbh (“Mave”). She helps children with Autism and their families and her boyfriend is working at Amazon while he prepares to become a police officer. Bus rides are so much fun because of the people you meet and the concersations you have. Beautiful green everywhere. Thinking of Mandi – she’s in Prague with some friends right now. The human-population-density out here has dropped below the cow-population-density. Now I understand where all that butter comes from. We’re honking as we turn the corners because the roads are narrow and we can’t see around the bend. Pastures are getting bigger and the sheep and horses have taken up shared residence with the cows. In Skibbereen, time to change busses. I sure wish I hadn’t drank that whole coffee so fast, glad to have a break. 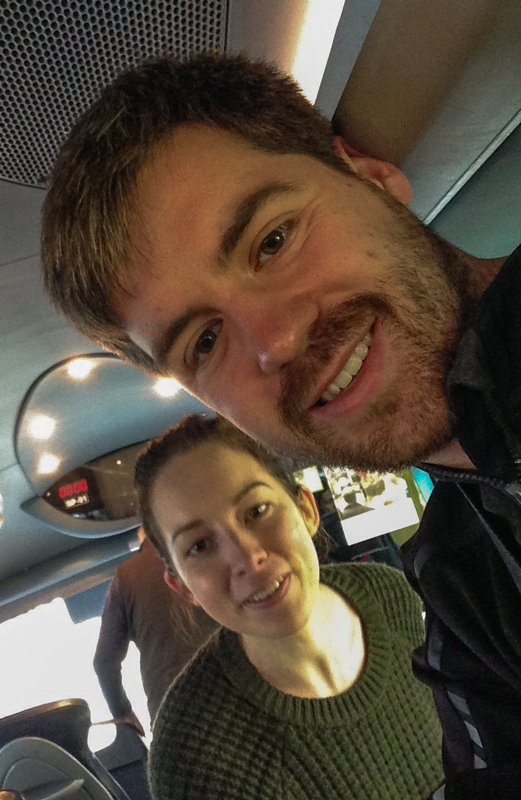 On the new bus. This day has been going too well, I think I’ll try to balance that out. Maybe I’ll slam my tripod into my upper lip. Ouch! Okay, that hurt but it was tight climbing into my seat. Hopefully that’s the worst thing that will happen today. The hills here are about thirty feet high and about thirty feet wide and they have power lines draped across them. My heart goes out to the linemen who have to carry the poles and install them. Respect, my lineman friend. “Next house please” overheard – who needs a bus stop anyway? A man takes photos of the bay while his dog takes it all in. You’re telling me we’ll be navigating between those rocks? 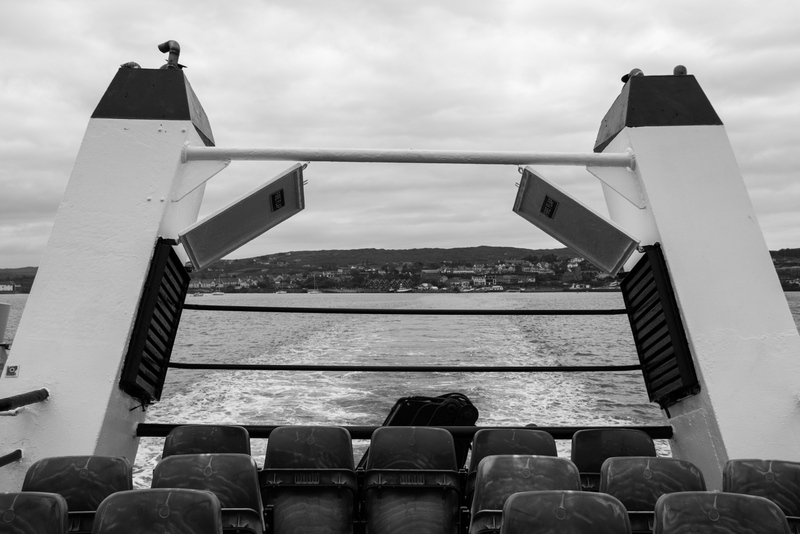 On the ferry. This is very exciting. Waves are much bigger out here than I remember from the beaches. Have I ever been so close to the ocean? I don’t think so – oh yeah, I was on that ferry across the English channel, but it was so big and I hardly felt a thing. Without land as a frame of reference, it’s hard to tell if the boat is tilting. It also seems like the waves don’t look as big even though they are bigger. Maybe it’s an illusion close to land or maybe the period of the waves is just bigger out here. I have a new appreciation for our ancestors who spent a month crossing the Atlantic. It’s fun right now, but we haven’t even lost sight of land and I can tell this would get old real quick. There’s Cape Clear Island. Much bigger and hilly than the map suggested. I think I see a seal string at us, poking his head out of the water. Too bad he disappeared before we got close enough to tell for sure. The waves are still getting bigger, and it’s starting to rain. I discovered that the waves amplify my stride, which results in sudden jumps and surges if you aren’t careful. Thankfully, I didn’t crash into the seat too hard 😉. With rainwater collecting, the steel floor is somewhat slippery and my face and hands are cold, but we’re coming up close to the harbor. Good heavens! A wave crashing into a rock just sprayed up at least sixty feet. Those cliffs are getting pounded high up. All of this plus the gentle roar of the water and the undulations of the boat are securing an unreal memory in my mind: a peaceful home and a slow-paced island. We’re bringing random deliveries from the mainland, coming into port. Of all things, the kids are kayaking in this cold rain. I made some people laugh the other day because I was cold. Not sure how you can be warm in such weather. We arrived at the dock and I started my ascent across the hill, which was taller than I expected. The island is gorgeous and covered in thick foliage. They are literally draping the power lines here – not with poles on hills, but I see actual cables laid on the (massive) rocks and hanging across the ravines. Here’s to hoping the rain stops. If it doesn’t clear I’ll be stuck with only having an amazing and unforgettable rest on the edge of the ocean. I’d hate for things to get that bad. There was an opening in the clouds at 10:00 pm in the forecast but the Milky Way will still be climbing over the horizon. I’ll climb up to the lighthouse anyway and see what I can get. Now I’m going to shower, warm up, and get ready. Wandering around the island. Taking lots of pictures in an amazing place. The clouds have lifted and the rain is gone. It’s a beautiful afternoon – warm in the sunlight. While taking pictures of some chickens, the farmer invites me to open the gate and come in. She shows me around and takes me to the pigs for feeding time. People have been really friendly here. As I leave she tells me to let myself in past the house to see the cows. I’m resting at the hostel and eating dinner. Tonight could be cold, long, and scary, so I want to be ready. Last time I did something like this was in the Black Forest and I was too cold so I ended up hiking all throughout the pitch-dark night. Tonight I have plenty of layers to keep me warm and a good flashlight. I look funny, like a stuffy clown. An abandoned lighthouse stands at the peak of the island. The shale shingles have fallen with failing mortar over the years. I’m at the lighthouse where I have chosen to take my pictures. Everything is charged and the sun is setting. Clouds hang on the horizon and loom against my hopes. It’s beautiful otherwise and extremely windy. One shot, one lucky shot. There I am – if only that had been enough to keep me warm! Still light out, but Venus and Jupiter have appeared and they’re super bright against the sky. It’s the first find of the evening. Now it’s Arcturus, Vega, and maybe Regulus. I’m getting excited. Venus and Jupiter have never seemed so bright or distinct. My phone screen is also bright despite being dimmed all the way. Good for the battery I suppose. Started shooting. The 50mm lens was too tight so I switched to the wide angle lens. It’s cold up here. The first volley was a test: 32 images at 6400 ISO, 7s each. Lots of stars but no Milky Way yet. I think there are clouds over the ocean masking it. I can see satellites now. Maybe it was ISS – not sure. Two just flew by on their polar route. Two meteorites have also shown up, though dim in magnitude. I’ve been taking lots of shots on different settings. All of them are around 64 frames at 10s each. This should keep star movement at a minimum and keep the stack size manageable. The current shot will be interesting to see: 12800 ISO. Wish it weren’t so windy because I’m trapped behind this wall; if it were still I could move the camera out and get a better angle, but I’m afraid I would freeze and the camera would shake. It’s unbelievable how dark it is. My phone on its dimmest setting illuminates the wall fifteen feet away and the lighthouse way out yonder lights up this area as if it were a strobe around the corner. All it takes to see a satellite is to look around for a moment and you’ll find one. Praise God for the weather – not a cloud in sight. Putting the camera to sleep for a while. Twenty-five minutes of running in place really warmed me up. My jaw was hurting from shivering. Getting ready for the last shot because clouds are rolling in. Only a glow of one arm of the Milky Way has been visible. The humidity over the water is likely too high to see it through all the atmosphere. I’m not disappointed though because the sky was great. I could wait until around 3:00 am when it should be in the ideal location, but I want to catch the 9:00 am ferry and that means I need to sleep. Besides, the cloud cover has followed the forecast almost perfectly and supposedly it will only get cloudier as the night goes on. It would actually be a shame if everything were perfect – I’ll need an excuse to do this again! The fogginess is dew that built up on the exterior of the lens. Pictures were dim and blurry. The lens had completely fogged over with dew, which means the temperature is dropping. I hope it was okay for that last shot because it was my favorite setup. Cleaning the lens cleared the image, so it’s one more shot now. Why did I go for 128 images? That’ll take half an hour; I don’t want to stay half an hour; there won’t be any stars left in half an hour. Stars are almost all gone because of the clouds. 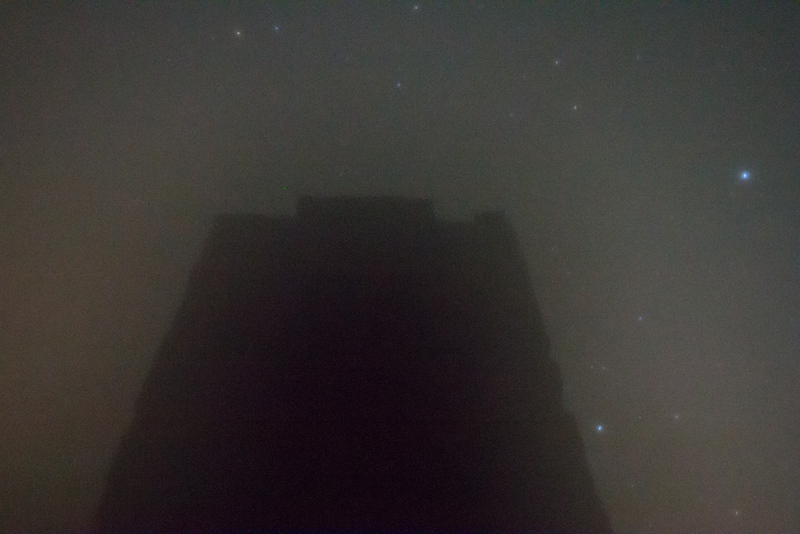 The clouds aren’t adding light pollution at least. They are black blobs in the sky. They do block the stars as they start to cover them though. Time to cut this short and call it quits. In my room again, the night is over. I’m looking forward to a nice hot shower to warm me up and relax before I sleep. The walk home was great; I was able to go without my flashlight for most of the way because the road surface was reflective enough that I could just barely make it out and follow down the middle. It was a seal after all! They pop their heads up out of the water for some reason and bob a while before diving back under. This is going to require some cleaning. I normally treat my computer with care, but last night I needed it out there in the dark to control the camera and I couldn’t really see – it was sitting on my bag to try and protect it from the ground. When I opened it here on the bus I found a worm trying to crawl into the heat vent. I hope a worm doesn’t void the warranty. Oh dear. Four shirts, two pairs of pants, two pairs of socks, a jacket, a wrap-around blanket that functioned as a makeshift hat or scarf or turban however you want to describe it, and one large towel came together to preserve my heat. Twenty-five minutes of exercise to generate some extra heat where my wardrobe failed to protect me. Thanks Mandi for sticking with me and pushing me to where I can just casually run for twenty minutes. Literally hundreds of pictures were taken of billions of stars. I stared straight down the middle our honest to goodness galaxy. Unbelievable. Hours and hours, days, and weeks of processing time and review on the computer before the results are ready to publish. Six and a half hours until my ferry leaves. Good night! Why is this after the summary? I thought the journey was done, but when I checked in to my hostel, I discovered that they cancelled my booking when I didn’t show up on the first night. It. was my intention to call ahead, but no cellular signal crawled across the bay to get to Cape Clear. Anyway, adventures! Right? After plenty of research (including the possibility of taking a ferry to Liverpool, train to London, and a flight home to Hannover) I found a room with airbnb down the street and booked the next three nights here at the hostel (albeit at about twice the rate of my original booking 😕). I’ve never had so hospitable of a stay with airbnb as I did with that Italian couple. Adventures! 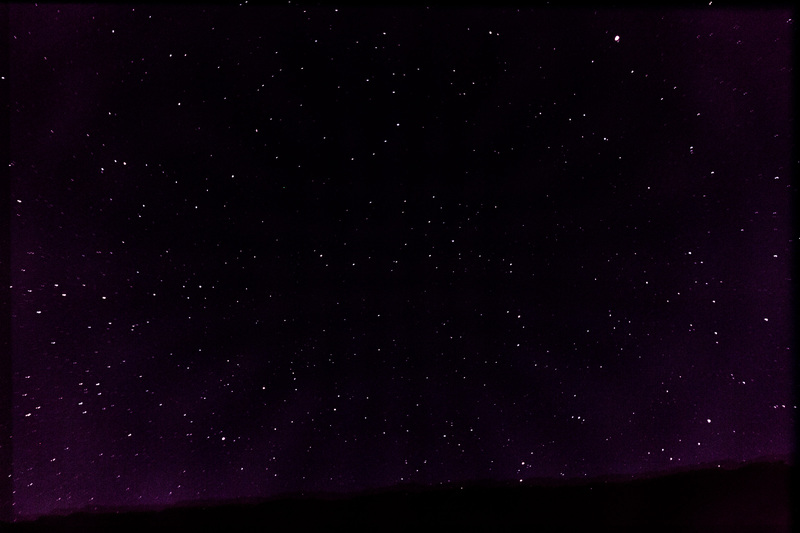 Not the best, and not at all like it was being there, but oh my, lots of stars. The old tower gave me my cover from the wind and a good concern for falling objects. Finally on the cusp of midnight the Milky Way was starting to reach around the horizon with its mighty red arm, making the trip worth it for this one crude shot. Loved this post! A couple of typos: concersations in the paragraph about your bus ride with that friendly Irish girl Meva, and “level” which I’m guessing you meant “leveled” referring to the ferry. Beautiful shots of the stars and the milky way… I took a slight interest in astronomy while living in Kansas due to 1) my boss owned a 10-in electronic telescope and 2) beautiful clear Kansas skies. 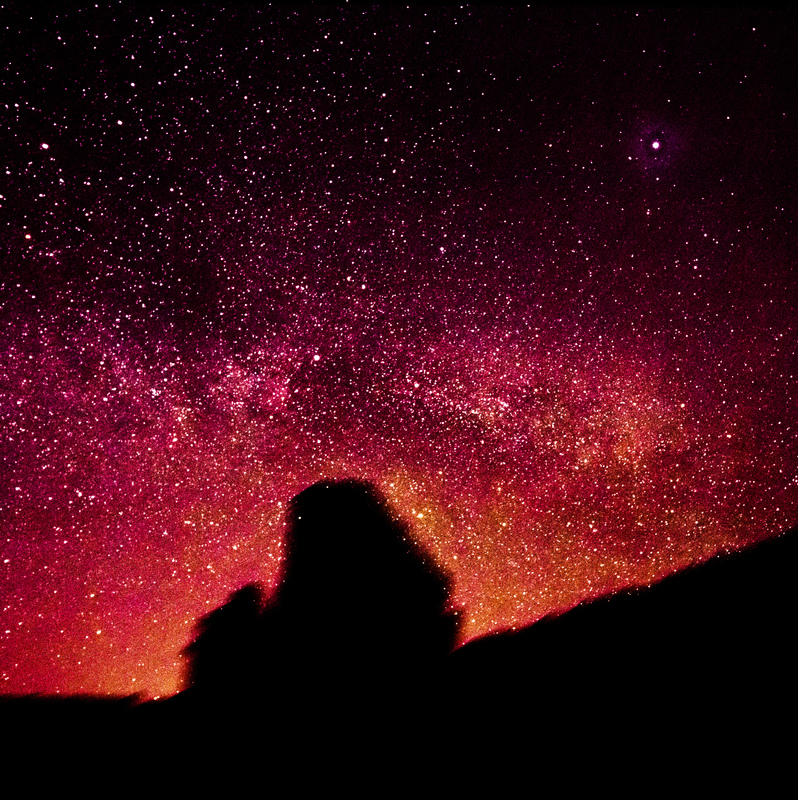 Star-gazing is a gorgeous hobby. Worth staying up. Oh! And only a EE major can call crystal glass insulators “beautiful”. Sigh!